Porthos earphones are unique and build around four key elements. It has built in functions like noise cancelling, directed noise, a sensitive trackpad and a Bluetooth 4.1 connection. The transparent parts in the earphone are 3D printed by Luxexcel. 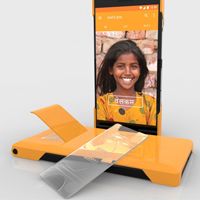 Vasu is a smartphone case meant for doctors in rural India, to diagnose malaria in the blood. It enables doctors to prescribe the proper amount of medication a patient needs. It works with a disposable chip, which guides the light from the flashlight through the chip and back to the camera. The Acryx shoe is the world’s first fully 3D printed shoe with 3D printed transparent parts. It combines NinjaFlex material and Printoptical Technology by Luxexcel. It serves as inspiration for the fashion and 3D printing industry. It resulted in a flexible shoe with transparent parts that do not need any post-processing. We would like to thank all the contestants for all of their participation. Would you like to get inspired? Take a look at the Delft University showcase page.